It’s that time again, the Powell County Lions Club Agricultural and School Fair kicks off on Saturday, Sept. 12 and runs through Sept. 19. 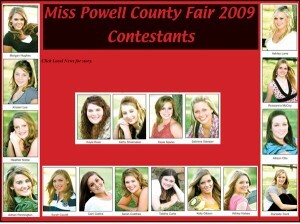 The usual kickoff to the fair will be the Miss Powell County Pageant, which is sponsored by the Stanton Woman’s Club. Eighteen local beauties will vie for the title and see who will wear the crown currently being held by Miss Powell County 2008, Meghan Mays. The pageant will be held on Saturday at the Powell County High School. Admission will be $5 for adults and $3 for students, while children under five are free. The actual carnival begins on Monday, Sept. 14, when the fairgrounds open at 6 p.m. The judging for fair exhibits will also be held that night beginning at 7 p.m. Meanwhile the Coca-Cola Talent Contest, as well as the Pet Show will start at 7 p.m. Admission is free on opening night. On Tuesday Kiddie Car Races begin at 7 p.m., while the Declamations will be held at the high school this year, also at 7 p.m. The Beef Cattle Show will be held at 6:30 p.m. The annual Baby Show, a huge crowd pleaser, as well as the Mother-Daughter and Father-Son Look-alike Contest are the big event for Wednesday. On Thursday, the Youth/Open Poultry Show will start at 6:30 p.m. But the big crowd of the evening will show up for the Greasy Pig Contest which begins at 8 p.m.
On Friday the parade takes center stage in the morning, however due to street construction, it will have a shorter route. The parade begins at 10 a.m. from the high school, eastward on College Avenue and then will turn left onto Washington Street across from Kroger, where it will finish at the Powell County Courthouse. Former Powell County Sheriff (1966-1970) Ernest Crabtree and his wife, a retired teacher from Bowen Elementary, Betty Crabtree, will be the Grand Marshals. Later that evening the Youth/Open Goat Show will be held at 4 p.m. The Truck Tug Contest is scheduled to begin at 7 p.m. The fair winds down on Saturday, Sept. 19 with two big events. The first will be just that for the Powell County crowd. A Lawnmower Derby will precede the main event of the night and possibly the fair itself, the Demolition Derby. All the fun begins at 6 p.m. with the lawnmowers and the cars start the carnage at 7 p.m.
• Sarah Crabtree, daughter of Sonya and the late Timothy Crabtree, sponsored by Dennis and Daughters Monument Company and Farm Bureau. • Morgan Hughes, daughter of David & Kathy Hughes, sponsored by Rogers Hardware and Tanner Dodge. • Kristen Lee, daughter of Waltes & Melinda Lee, sponsored by Parkway Florist. • Roseanna McCoy, daughter of Mary and the late David McCoy, sponsored by Meadows Golf Course and Neal’s Pay Lake. • Heather Noble, daughter of Sheila Pergram and Greg Noble, sponsored by Stanton Dairy Queen. • Allison Otis, daughter of Bentley Otis, sponsored by Crowe’s Custom Creations. • Kayla Rose, daughter of Michael & Donna Rose, sponsored by Joey’s Muffler Shop and Michael & Donna Rose. • Kathy Shoemaker, daughter of Thomas & Darlene Shoemaker, sponsored by Li’L Abners Motel and CRS Auto Sales. • Danielle Trent, daughter of Lisa and the late Larry Trent, sponsored by WSKV. It has been an eventful holiday weekend for one local family. It began with an alleged hit and run accident at Clay City Elementary and ended with both husband and wife being arrested. The surprising part of the story is that the husband is a Powell County Magistrate. Magistrate Bobby D. Ginter was arrested Saturday evening at his residence after a warrant had been issued for him. According to police citations recording the arrest, a warrant had been issued for Ginter on the charge of indecent exposure. According to one source, Ginter, 67, is accused of relieving himself in front of five children. He was arrested by Kentucky State Police Trooper Charlie Bolin on the warrant and lodged in the Powell County Detention Center. Ginter’s wife, Doris Ginter, 58, has made two trips to the detention center since last Thursday. According to Clay City Police Chief Shannon Taylor, dispatch received a call around 5 p.m. last Thursday claiming that a vehicle driven by Doris Ginter had run over some traffic safety cones and backed into a truck owned by Clay City Elementary Principal Susan Miller. The caller told police that she had notified Ginter she was calling police, but Ginter left the scene. Her car was later found at her residence on Hardwick’s Creek. Chief Taylor began working on a warrant for the hit and run accident that evening. Before it could be completed and served, Ginter was arrested around 9 p.m. by Powell County Deputy Grant Faulkner for possible DUI. She was released on bond and back home by Friday evening. Bobby Ginter was released on Sunday, while his wife Doris, was released on Monday morning. Their court appearance is scheduled for Sept. 22.